Graduated from École Supérieure d'Électricit? (SUPELEC), PARIS, France in 1964 (M.Sc. in EE). October 1964 - March 1966: Professor of Electronics at the French Navy School (Ecole Navale,Brest). April-December 1966: Stays at Angus (UK) & SEREB (France). January 67 - March 69: Systems Engineer, EDF (Electricit?/span> de France), D?/span>partement des Etudes et Recherches (Research Department). March 69 - February 71: Systems Engineer, CII (Compagnie Internationale pour l’Informatique). At CERN from March 71 until July 2006, in the Information Technology division, (6 month special leave as a guest scientist at IBM’s T.J. Watson research centre from July 1980 till December 1980 excepted). Independent ICT consultant since mid-2006 primarily working as an expert for European Commission’s FP7 ICT Projects and Calls (evaluation of project proposals and project reviews). 71-76: Leader CDC 7600 section (software group). 76-84: Leader IBM software section (software group). 84-89: Member External Networking section (communications group). From mid-89 till October 2004: Leader External Networking section (communications group). From 2001 till 2003: Deputy Group Leader (communications group). 2004-2005: Technical Program Committee Chairman TERENA 2005 Conference (Poznan). 2005: International Workshop on African Research & Education Networking. Author of the CDC 7600 Job Scheduler & Integrated Tape Staging Utility (FIND). These, as well as other, so called, “CERN mods”, have been in wide use in the very restricted supercomputer community around the world during the CDC 7600 era. Close involvement in numerous system performance and network traffic studies. Key role in central IBM systems deployment (e.g. HSM, JES2, MSS, Wylbur). Responsibility for the adaptation of PC based IP gateways for LEP controls. Key role in EARN/BITNET and electronic mail deployment. Key role in the deployment of HEPnet and TCP/IP (Internet) communications. CERN Project Team Leader for the European Union project BETEL (Broadband Exchange over Trans-European Links) - 1993. Participation to the European Union projects BETEUS (Broadband Exchange for Trans-European Usage) and STEN (Scientific Trans-European Networks) - (1994-1995). Participation to the Geneva-MAN (155 Mb/s ATM based Metropolitan Area Network) - (1995-1996). Chairman US Line consortium (USLIC). Since 1995, CERN, IN2P3, US DoE through Caltech, HEPnet Canada through Carleton University and World Health Organization (WHO), decided to organize their Global Internet connectivity through the USLIC in order to benefit from economy of scales. The USLIC successfully managed numerous upgrades of the CERN-USA links from 1.5Mbps in 1995 to 10Gbps in 2003 (i.e. almost a factor 1000 in less than 10 years). 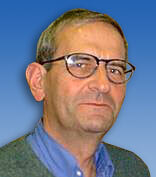 Co-founder of the CERN Internet Exchange Point (CIXP). The rapid deployment of the CIXP is the main reason that led more than 14 Telecom Operators to have presence at CERN, bringing an estimated number of over 1000 strands of fibre in the computer centre, which is very important for present and future LHC networking needs. EARN ("European & Academic Research Network") - Member of Board of Directors (1989-1994). RARE ("R?/span>seaux Associ?/span>s pour la Recherche Europ?/span>enne") - Member of Council of Administration (1994). TERENA (Trans-European Education & Research Networking Association) - Member of General Assembly & co-opted member of TERENA Technical Committee (1995-1998). Member of the TEN-34 (Trans-European Networks - 34 Mb/s) Technical Committee (1996). Member of the STARTAP (Science Technology And Research Transit Access Point) Technical Advisory committee. "Where is the Internet heading to? ": O. Martin, May 17, 2009 [doc], published in the NEC'2007 conference proceedings. "State of the Internet & Challenges ahead": O. Martin, March 17, 2008 [doc], published in the NEC'2007 conference proceedings. "The ongoing evolution from packet based networks to hybrid networks in research & education networks": O. Martin, February 8 , 2006 [doc], published in the NEC'2005 conference proceedings. "Main HENP report to ICFA": H. Newman, February 10, 2005 [doc]. Chapter 14: "Wide Area Network Technologies update": O. Martin, Dan Nae, S. Ravot. "shift/BETEL": A (very) distributed mainframe, presented at the CHEP'94 Conference, San-Francisco, B. Segal, O. Martin. A perspective on the "shift/BETEL" project (CN/94/03), presented at the 15th "Speedup" workshop, Lugano, O. Martin. Broadband Exchange over Trans-European Links (BETEL), (CN/93/15), presented at the SMDS conference, Amsterdam, O. Martin. IP Trafic Measurements and Analysis at CERN (CN/93/11), presented at the INET'93 conference, San-Francisco, J. Yu, O. Martin. Performance measurements on the CDC 7600 at CERN (DD/76/17), presented at the VIM 25 Conference, Chicago. Performance measurements on the CDC 7600 at CERN (DD/75/10), presented at the VIM 22 Conference, Amsterdam.